Eye makeup to see you through laughter and tears. Who said applying eyeliner was a tricky task? 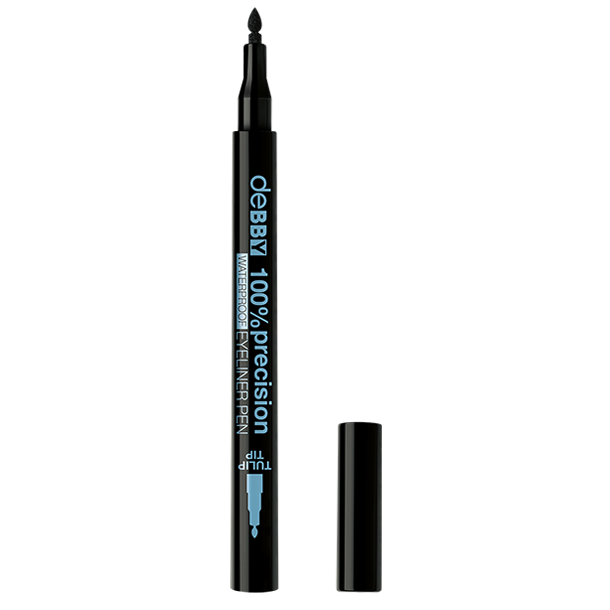 The flexible tulip-shaped tip draws a thin, precise line and is ideal for creating dramatic definition. Long lasting waterproof eyeliner. This blackest of black eyeliners glides on effortlessly. Suitable for contact lens wearers. IL070217A INGREDIENTS: AQUA, ALOE BARBADENSIS LEAF JUICE, STYRENE/ACRYLATES COPOLYMER, POLYURETHANE- 35, LAURETH- 21, POLYGLYCERYL- 2 CAPRATE, METHYLPROPANEDIOL, PEG- 40 HYDROGENATED CASTOR OIL, GLYCERIN, BUTYLENE GLYCOL, TRI-C12-13 ALKYL CITRATE, PHENOXYETHANOL, CAPRYLYL GLYCOL, PANTHENOL, STEARIC ACID, PALMITIC ACID, SODIUM DEHYDROACETATE, TOCOPHEROL, PHENYLPROPANOL, ETHYLHEXYLGLYCERIN, TETRASODIUM GLUTAMATE DIACETATE, HELIANTHUS ANNUUS SEED OIL, CITRIC ACID, SODIUM HYDROXIDE, CI 77266 [NANO].